Nevosoft presents LandGrabbers, an original and captivating combination of strategy, simulation and resource management game, already recognized as the Best Casual Game of the Year at the 2011 Russian Game Developers Conference! The main aim of LandGrabbers is to capture enemy fortresses and maintain your winning march through three diverse locations: a forest, a desert and an iceberg. To take over an enemy or neutral settlement, simply click your own castle then the building you want to attack and that’s it! Half of your available troops rush out of your base and charge their intended target. 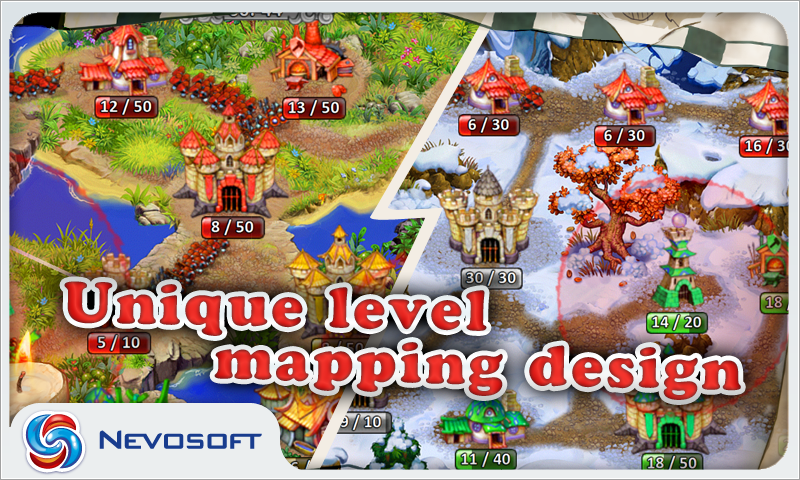 You’ll conquer it if your troops outnumber the targeted building, and then it’ll start generating soldiers for you. Occupy defence towers to meet enemy troops with gunfire. 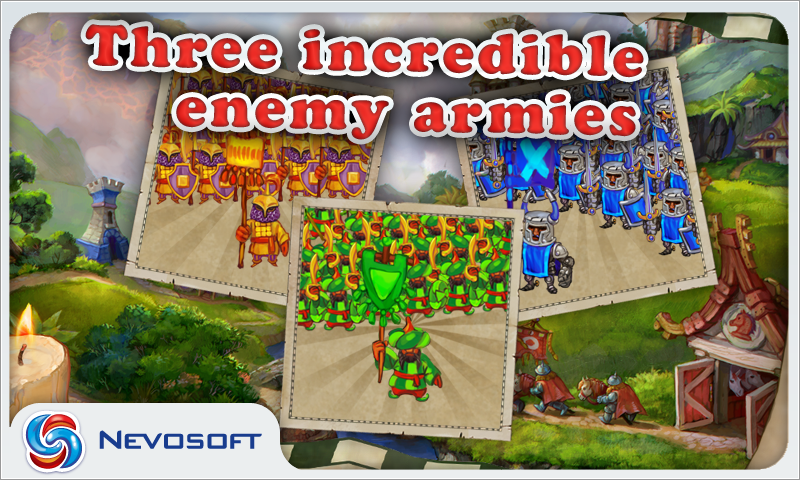 Send your troops to a stable or armory to make your soldiers twice as fast or strong, respectively. 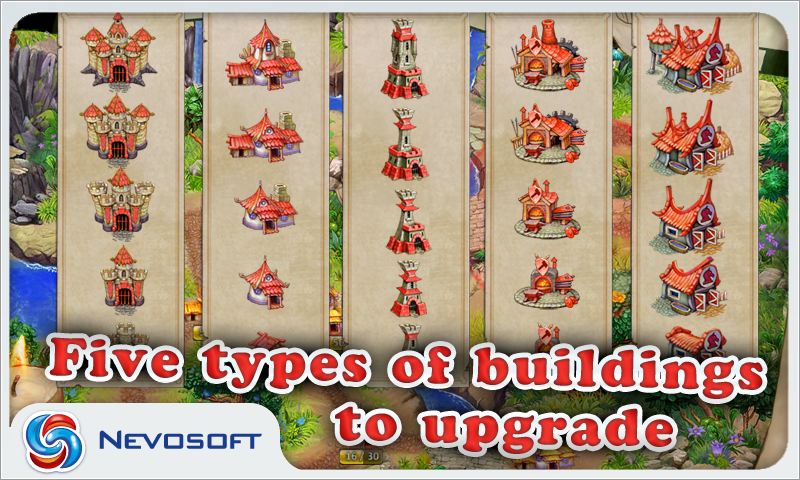 Upgrade your buildings to produce more troops. Three difficulty levels will challenge even experienced strategy experts and gorgeous graphics together with catchy soundtrack will create a medieval atmosphere. Immortalize your brave deeds by earning original trophies that can easily be shared friends on Facebook or Twitter. This “casual strategy” is spiced up with mixture of great humor and colourful graphics and has everything to get a player glued to their Android device for hours! Nevosoft presents LandGrabbers, an original and captivating combination of strategy, simulation and resource management game, already recognized as the Best Casual Game of the Year at the 2011 Russian Game Developers Conference! The main aim of LandGrabbers is to capture enemy fortresses and maintain your winning march through three diverse locations: a forest, a desert and an iceberg. To take over an enemy or neutral settlement, simply click your own castle then the building you want to attack and that’s it! Occupy defence towers to meet enemy troops with gunfire. 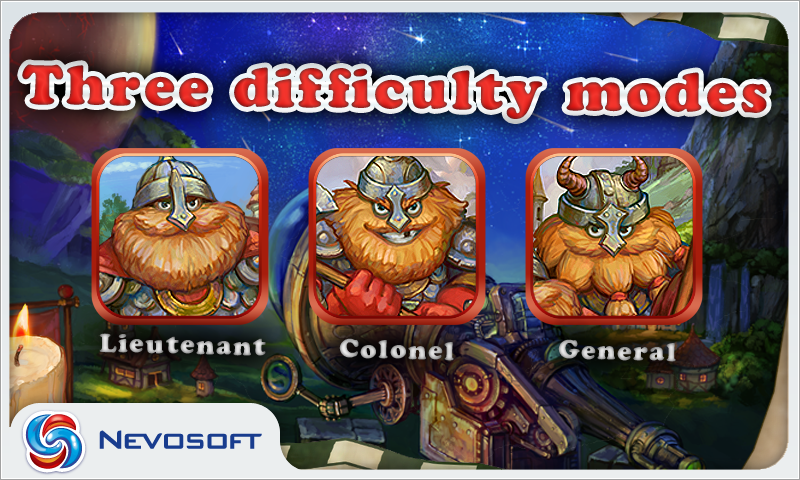 Send your troops to a stable or armory to make your soldiers twice as fast or strong, respectively. Immortalize your brave deeds by earning original trophies that can easily be shared friends on Facebook or Twitter. This “casual strategy” is spiced up with mixture of great humor and colourful graphics and has everything to get a player glued to their Android device for hours! Nevosoft presents LandGrabbers, a captivating combination of strategy, simulation and resource management game, recognized as the Best Casual Game of the Year at the 2011 Russian Game Developers Conference! Attack enemy or neutral settlements with only two clicks! 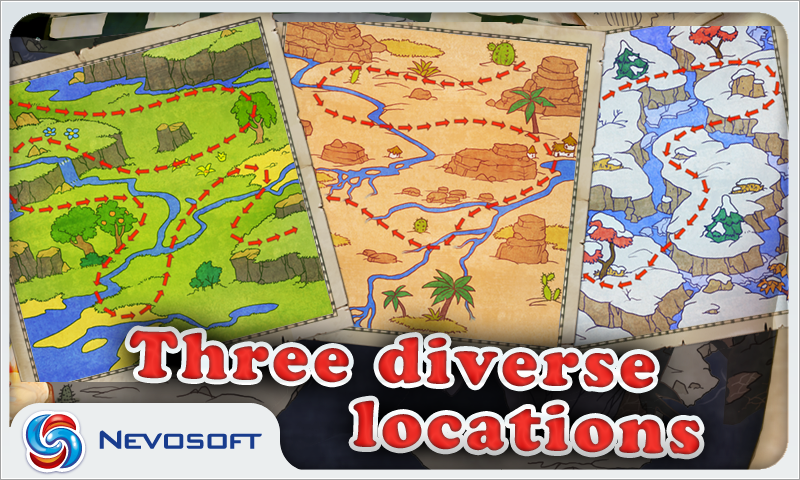 March through three diverse locations: a forest, a desert and an iceberg. Immortalize your brave deeds by earning original trophies that can easily be shared friends on Facebook or Twitter.